Remember when set-top boxes were actually, you know, boxes? Now they’re tiny little dongles that plug into the HDMI port on the back of your TV and give you access to Netflix, Amazon Video, Hulu, and every other streaming service imaginable. It’s awesome that so much power can be tucked away behind your TV, but having yet another power cord to deal with ruins it. That’s where the fireCable Micro USB Cable comes in. 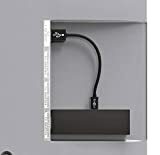 Instead of plugging your Fire TV Stick or Roku Streaming Stick into the wall for power, this little cable lets you connect to a USB port on the back of your TV for power. In other words, you can cut the actual cord now that you’ve cut the proverbial cord.